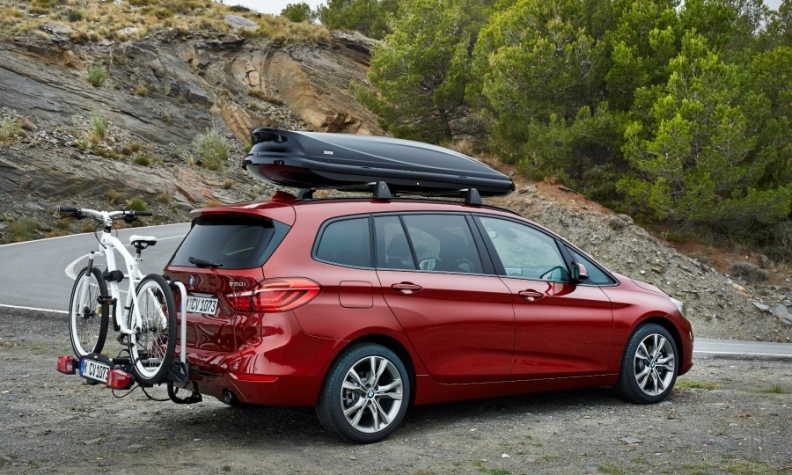 BMW's 2015 launches include the 2-series Gran Tourer, shown, which will be sold in Europe and China but not in the U.S.
MUNICH -- BMW said it expects 2015 sales volume and profit will slow this year because of aging models and higher investment costs for new technologies. The company expects its car sales and profit to rise by a medium to high single-digit percentage this year after 2014 group earnings before tax rose 10.3 percent to 8.71 billion euros ($9.23 billion). "As always, our forecasts assume the economic conditions worldwide remain stable and won't deteriorate. However many uncertainties remain: Important markets like China are losing momentum," CEO Norbert Reithofer said at the company's annual results press conference today. At his final annual results conference after 8-1/2 years as chief, Reithofer, who received 7.49 million euros in total pay for 2014 according to the group's annual report, said there were challenges ahead for his successor Harald Krueger, who takes over on May 13. "The team I'm leaving knows very well just how much there is to do in the years to come," Reithofer said. "The future belongs to the next generation. It is for them to shape the company's further development according to their vision." The company's 2014 results were the fifth record year in a row for the automaker since the global economic crisis, Reithofer said in a statement. Sales of BMW, Mini and Rolls-Royce vehicles increased 7.9 percent to 2.12 million last year. U.S. sales for BMW Group rose 5.3 percent to 396,750 vehicles last year. Group revenues increase 5.7 percent to an all-time high of more than 80 billion euros. Revenues were primarily sales-driven and increased by 6.8 percent adjusted for currency translation effects, BMW said. The automotive division achieved an EBIT margin of 9.6 percent, which was at the upper end of its target range of 8 percent to 10 percent, BMW said. BMW said fourth-quarter group pretax earnings were on par with the previous quarter at 1.87 billion euros. Fourth-quarter retail sales were the highest to date with significant gains over the previous year. Higher volumes and currency tailwinds resulted in a significant increase in revenues to 22.7 billion euros, BMW said. The automotive division had a quarterly EBIT margin of 8.2 percent within the target range of 8 percent to 10 percent despite the high level of expenditure, the company said. Last year, BMW invested almost 4.6 billion euros on new models and technologies such as self-driving systems last year. That meant capital expenditures amounted to 5.7 percent of revenue, slightly higher than its goal of spending 5 percent to 5.5 percent. For this year, the company will try to keep the figure within that target range, Chief Financial Officer Friedrich Eichiner said in a statement. BMW stuck to its goal of profit margins for the automotive division in a range of 8 percent to 10 percent of sales. "BMW has clearly shifted down a gear with its outlook," said Juergen Pieper, a Frankfurt-based analyst for Bankhaus Metzler. "BMW is held back by a comparatively older product lineup." BMW is bringing out 15 new and refreshed models this year, including the seven-seat 2-series Gran Tourer compact minivan and a refreshed version of the top-of-the-line 7-series sedan. The company expects to set a new record for the number vehicles delivered this year. "We intend to remain the world's leading premium-car company," Reithofer said. Audi, the world's No. 2 premium brand by unit sales, and third-place Mercedes-Benz both aim to overtake BMW in sales by the end of the decade and have been closing the gap. Audi outsold BMW's main brand in the first two months of 2015, while Mercedes posted the fastest growth rate of the three German luxury-car producers in the period. IHS Automotive estimates that the BMW nameplate will maintain its full-year lead with sales of 1.82 million cars, compared with 1.7 million deliveries by Audi and 1.6 million by Mercedes.